Boneco - 7144: Humidifier Review • The Air Geeks, reviews of air conditioners, dehumidifiers and air purifiers. Dry air is said to cause an irritation on the throat or a thirsty skin which seems to be beyond the help of a cold drink or a moisturizer. When the climate of your living or working area is so cold, and the doors of your house are forever closed there is a high possibility that the air inside your house is dry. Normally, a room’s humidity level is expected to range between 35-55% and its ideal to live with without cold, sinus, or allergies or dry skin issues. Anything below this range can be said to be too low and other than having some effects on your family’s health may also have an impact on your wooden furniture, floor, paintings as well as musical instruments. Dry air in a room asks for nothing more but a humidifier, which is surely going to make everything in your house rejoice in the moist air. Let’s have a look at the BONECO 7144 Humidifier. While most people will look for gadgets and appliances that are operational and able to do the work intended for them, an attractive design comes an added plus. After all, why should something which is placed in the sight of everybody be ugly? For that reason, Boneco 7144 Ultrasonic humidifier did not neglect this aspect but ensured that as much as it does the work it is also beautifully styled. It produces both the cool and warm mist which is totally dependent on the users’ choice. While releasing the evaporative mist, it does so in a quiet whisper using high-frequency vibrations, which are not disruptive. The double jet nozzle allows the mist to be dispersed in different directions. Boneco 7144 Ultrasonic humidifier has a built-in hygrostat which takes note of the room’s humidity and temperature levels in order to release the right mist amount. The Intelligent Temperature Compensation technology used to design it makes it possible for the output to be automatically adjusted in case of a condition change. It also has a large digital display which allows ease of operation. Besides, this humidifier has a sleep and auto mode button to allow continuous operation of up to 8 hours, as well as a regulator button for output. The display also practically shows reminders when the tank requires cleaning and when a refill is needed. This Boneco humidifier has a transparent water tank which makes it is easy to fill. This tank can hold up to 3.5 gallons of water which can be used for approximately 24 hours in a sizeable room of about 60 square meters. The inside of the water tank is lined with a demineralization cartridge which is replaceable, for easy cleaning. 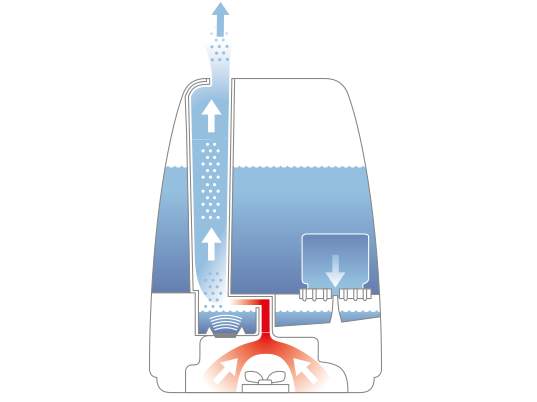 The hydro cells and EZCal also aid greatly in the maintenance of this humidifier by keeping the water clean and fresh. The activated carbon Hydro cells remove impurities, bad smell, and heavy metals from the water. The Boneco 7144 is small in size with a height of 13.7 inches, 10 inches length and a width of 11.4 inches. It weighs 4 kg when empty, making it quite portable. It is an energy efficient humidifier, with a power consumption of 40 watts and comes in white/black and silver/black colors. Functionality: Functions pretty well. while operating quietly. Settings: Has a pre-set timer of up to 8 hours. Very accurate humidification settings. The warm setting works very well too. Make a room feel more comfortable without getting too soggy and stays very clean. The only complaint is it’s a bit noisier than some ultrasonic humidifiers I have. Not terrible, just not as silent as I’d like. " Works well- Very responsive customer service is a bit of a pain. I've had mine for a little less than 3 years. The controls are intuitive and it works well for a single room. It’s a pain as you must invert the tank to fill it. What most impressed me is the customer service - my unit stopped functioning slightly shy of 3 years and the company promptly sent me a new unit in exchange"
The Boneco 7144 Ultrasonic humidifier is a nice humidifier and does the work perfectly well. It also requires little maintenance and once the water tank is full it can keep the air humidified for up to 8 hours. It is perfect for a single room which is quite okay and doesn’t leave you with only one option which is cool mist since it also has a feature for warm mist. In spite of these good features, the Boneco 7144 also has its bad side. It is not so quiet and the noise can get louder with time, making it a bit annoying. Additionally, the refilling process is not as easy as it is the case with most other humidifiers, but eventually gets refilled. However, these few defects don’t nullify the good work done by this humidifier and I would definitely recommend it. It is worth your money, go for it today.